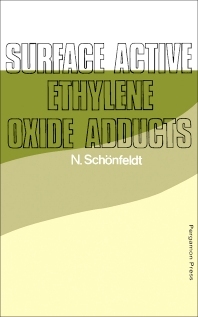 Surface Active Ethylene Oxide Adducts covers the fundamental problems associated with the surface active ethylene oxide adduct. This book contains six chapters that consider the progress on modifications of ethylene oxide adducts. The opening chapters examine the preparation and industrial application of ethylene oxide adducts. These chapters provide a formulation based on the starting materials and divides the ethylene oxide adducts in different classes according to the bond between the hydrophobic and the hydrophilic part of the molecule. The next chapters describe the physical, chemical, and functional properties of these adducts. These chapters also look into the biodegradability and industrial uses of ethoxylated products, with an emphasis on their applications to the mineral oil industry. These topics are followed by discussions of the chemical modifications of ethylene oxide adducts, including etherification of the terminal hydroxyl group with aliphatic or cyclic, hydrophobic radicals and carboxymethylation of adducts. The final chapter focuses on the analytical methods used in the industrial control laboratory an in product analysis. This book is intended primarily for laboratory chemists, plant chemists, and chemical engineers.